When we talk about winter in Tahoe, perhaps using “cool” in the same sentence isn’t the best usage of words because Lake Tahoe winters are downright cold. So, if you consider cool in a non-literal sense, you’ll see that Tahoe offers some really cool spots to marry the one you love in an informal and somewhat of an untraditional way. One of the coolest wedding sites on the south shore and one in which you will need a pair of skis is located on the top of Heavenly Mountain. You’ll begin your adventure at the gondola base where boarding of the tram takes place and travel two miles up the mountainside. After exiting the gondola, further ascension up the mountain takes place on a ski lift. 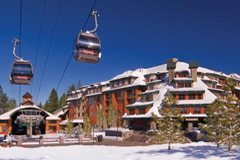 From the top of the lift you’ll ski to an ideal spot situated at an altitude of approximately 9,000 feet. 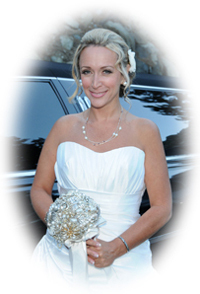 Words fall short of describing the actual sight where vow exchanges take place, but the display of beauty before you consists of an all-encompassing view of the flawless exquisiteness of the lake and surrounding snowcapped Sierra Nevada Mountain Range. It is truly a sight of untold beauty. If you’re not an avid skier – though you don’t really have to be for our Heavenly ski wedding – and prefer something a little less daunting but like the idea of marrying amidst the snow laden Sierras, Heavenly Mountain Resort offers a midway station where you can disembark the gondola prior to reaching its final destination at top. The midway station has a huge circular observation deck allowing yet another great view of the pristine water of Lake Tahoe with the encircling Sierra Nevada. It’s a panoramic sight a thousand words couldn’t describe. You’d have to see it for yourself! What’s great about having a wedding in these cool places is that they’re informal, which means that in the midst of a chilly wintery day you can bundle up as warm as you like and not have to worry about snowflakes dropping down your backless wedding gown. 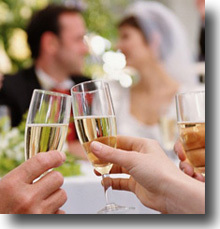 It’s a fun way to get married and lends an opportunity to create spectacular memories. 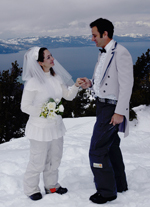 Winter weddings on skis at the magnificent Heavenly resort or on the observation deck are only but a few of the cool ceremony sites Tahoe has to offer. There’s a host of other places located throughout the south shore including sleigh ride weddings, beach and boat ceremonies, and much more. If you’d like additional winter wedding ideas or simply want to find out more of what Lake Tahoe has to offer, let us give you a tour of the assortment of the many cool and trendy year-round wedding sites found along the shores of this beautiful alpine utopia.